Last June 24th the Innocenti Museum was reopened after extensive renovation work and just after Christmas the facade was unveiled. The Museum is housed in the complex built by Filippo Brunelleschi, the famous Hospital of the Innocents, a major symbol of Renaissance architecture and civilization. It combines Brunelleschi’s talent with a take on everyday life in ancient Florence, a city devoted to commerce and money but capable of great generosity. With no desire to romanticize, one can say that the Arte della Seta (Guild of Silk), that allocated huge sums for the foundling hospital, was ahead of its time in conceiving charity, not only as a mean to the salvation of one’s soul, but also as an act of civility. A visit to the Museum of the Innocents helps to understand the Renaissance civilization, based both on beauty and education. Today, after the complete renovation, the accessible areas have been expanded but part of the building still houses a kindergarten, a research center and an archive. The visit starts in the basement. Portraits of benefactors and Spedalinghi (directors) together with artifacts, reliquaries and old coats of arms tell the story of the institution through the centuries. A quite unique area has multiple drawers that visitors are allowed to open. Many parents did not want to give up hope of being able to recognize the little baby that they had been forced to abandon, so the hospital has preserved a large number of medals, coins, scraps of paper: memories of feelings, pain and hope. Screens display archived documents and videos that tell stories of abandoned children left in the care of the hospital. One cannot remain indifferent to the stories of so many little lives. The art gallery on the first floor has been completely redone. Some works were sold in the past to support the activities of the Hospital, but masterpieces created for the church or donated by benefactors are still many: the marvelous altarpieces by Ghirlandaio, Piero di Cosimo, delicate Madonnas of Botticelli, and the little ‘putti’ by Luca della Robbia. Access to the museum is on the right side of the porch overlooking Piazza SS. Annunziata. New and modern brass doors give access also to a specialized bookshop and to the stunning Cafeteria, located on a back terrace (once used for laundry! ), and offering a view that extends from Brunelleschi’s dome to the hills of Settignano. Filippo Brunelleschi did not see his project completed before his death, but the effect of the piazza’s architectures affirms a concept of space made to measure for the new Renaissance man. Inside the Hospital of the Innocents the abandoned children would be, as conceived by ​​Brunelleschi, educated as new men, as advocated in Plato’s Republic. This project of Brunelleschi was not destined to succeed, but it is interesting to retrace the history of this utopia. The square itself is already the beginning of a journey into that world, which is perceived in motion and capable of progress: It was the first square conceived as a unified urban space since antiquity. Brunelleschi began to build the hospital in 1419. He designed it for the training of new ideal citizens. Walking under the porch, children and tutors would, as in Athens, hold philosophical conversations. From this same porch they would access the place of spiritual nourishment: the church. In perfect symmetry there would be a refectory, where the children would receive their meals (material nourishment). On the opposite side of the porch he had planned workshops where children would be educated to work. The dorms for the boys would be in the basement. Both the main door of the church and the workshop would open onto the men’s courtyard. The commission controlling the progress of work harshly criticized Brunelleschi. It was clear to them that before you can train a boy in philosophical conversation the babies had to be weaned. Brunelleschi had not thought of rooms for nannies and nurses, or nurseries for babies and children. Finally Brunelleschi had completely left out girls who were most frequently abandoned and inside the hospital would either become maids or enter the church. These criticisms led to Filippo Brunelleschi’s abandonment of the project in 1427. The works began only in 1436 under the direction of a member of the Arte della Seta. Filippo expressed his disappointment and criticism, but by then the complex was destined to become what we see today. On February 5th, 1444 the first abandoned baby entered the Hospital: a little girl who was named Agata Smeralda. Since then many thousands of children have passed under the elegant arches of the hospital, left on the wheel, now on the north side of the porch. 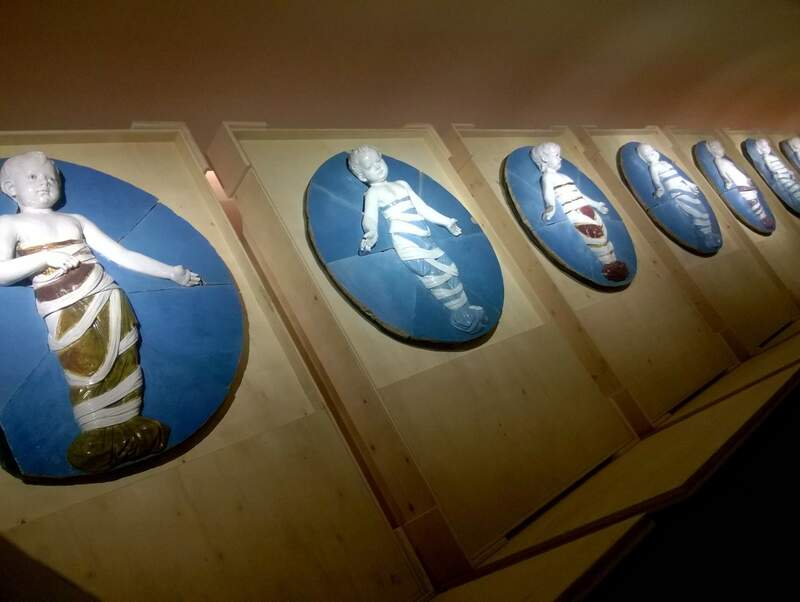 Even for those who know Florence and have visited the city more than once, a visit to the Museum of the Innocents will open a new and important chapter in the history of the Florentine Renaissance. Taking you through the halls and cloisters we will try to bring back those stories, we will enter an architecture born of elevated ideals, and witness the result of generosity that served the lives of many.